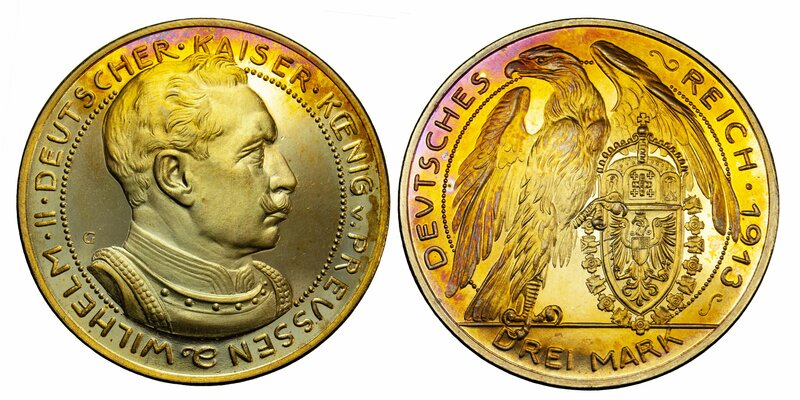 Germany, Prussia, Wilhelm II (1888-1918), unofficial pattern 3 Marks, 1913, bronze, by Karl Goetz (Kien. 76; Schaaf 113/G1). Brilliant, colourful tone on reverse, virtually as struck. Germany, Prussia, Wilhelm II (1888-1918), unofficial pattern 3 Marks, 1913, bronze, by Karl Goetz (Kien. 76; Schaaf 113/G1). Brilliant, colourful tone on reverse, virtually as struck.